Entitled La Borinqueña, the comic features a Nuyorican superwoman who acquires her powers -- like superhuman strength and the ability to control weather -- while visiting some caves in Puerto Rico. 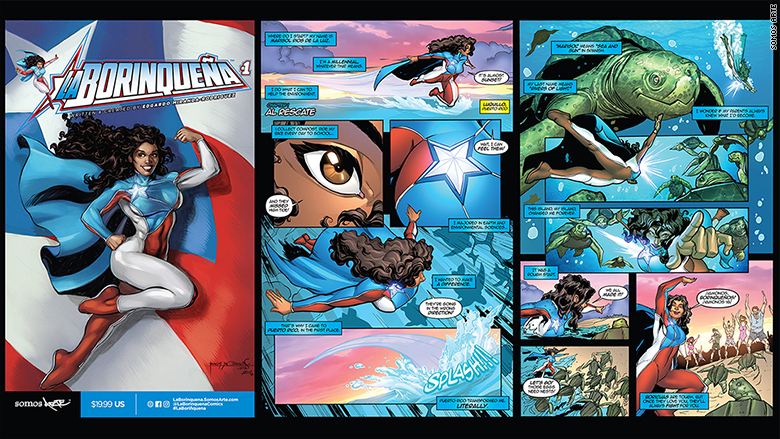 Using story lines that infuse Puerto Rican history and culture, Miranda-Rodriguez wanted La Borinqueña to be a symbol of hope for the hard hit island. So far, the response has been overwhelming. Miranda says the first printing of La Borinqueña has almost sold out. Legendary illustrator George Perez, known for The Avengers and Wonder Woman, will create a new cover for the book's second printing in February. "[La Borinqueña] is an icon, and Latinos are recognizing her for that," said Miranda, who self-published the comic. Born in New Jersey, Miranda lived in Puerto Rico for eight months when he was eleven years old. There, his artistic ability was nurtured and his Puerto Rican pride grew. He eventually headed back to U.S., where he graduated from high school, and later attended Colgate University on a full scholarship, graduating with a Bachelor of Arts in 1998. 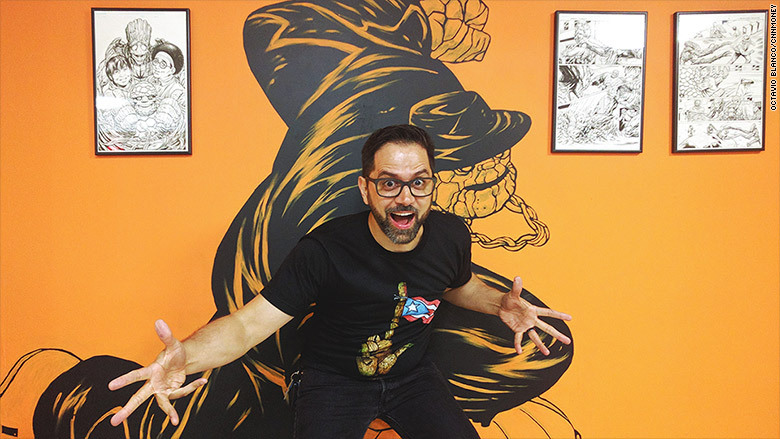 He has since gone on to found his own design studio, Somos Arte, and he has co-founder of graphic novel publishing company Darryl Makes Comics. Miranda hopes that La Borinqueña will inspire more Latino artists seeking to make it in the comic book world. 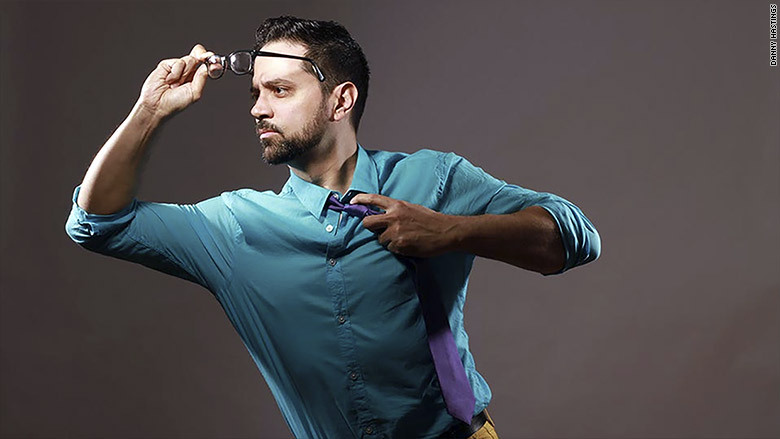 He plans to introduce his comic and tell his story at various youth conferences across the U.S.
Edgardo Miranda-Rodriguez as a child. Family was just the three of us, my mom, older brother Axel and myself. My younger sister Marisol would be born later. My mom collected public assistance. We were already so poor and then someone stole my mom's Social Security number to work. Since the system showed her as working, she was blocked from collecting food stamps for about a year. We didn't have any money. We would sometimes eat just warm water mixed with Adobo seasoning. I wrote a poem after college describing the experience called Adobo Soup and performed it at the Nuyorican Poet's Café. I lived in a different neighborhood almost every year. One neighborhood in the Bronx was so jacked up that my mom said, "you don't have to go to school while we look for another apartment." I stayed at home for about three months reading comics and watching PBS. When I finally went back to school, I found that I had been discharged and held back. That crushed me. I was a very good student. "I often wondered what would my life be if my parents had stayed together," Miranda-Rodriguez said. [Comic books] were my escapism. I'd collect bottles and cans to buy them. My mom always yelled at me to get rid of them. I stayed home reading and drawing. I'd create my own characters and kids would ask me to draw stories for them and I'd sell them. When I was about 14, we moved to Puerto Rico. My stepfather had trouble getting work in Puerto Rico but he had family in Reading, Pennsylvania, and wanted us to move there. My mother and him went to Reading and left me behind with my uncle Joaquin. That was fun because I was around all my cousins. I got into church and I was drawing a lot. My uncle and aunt would buy me paints and art supplies. My cousin Jonathan still has the original painting I did of Wolverine when I was 14. 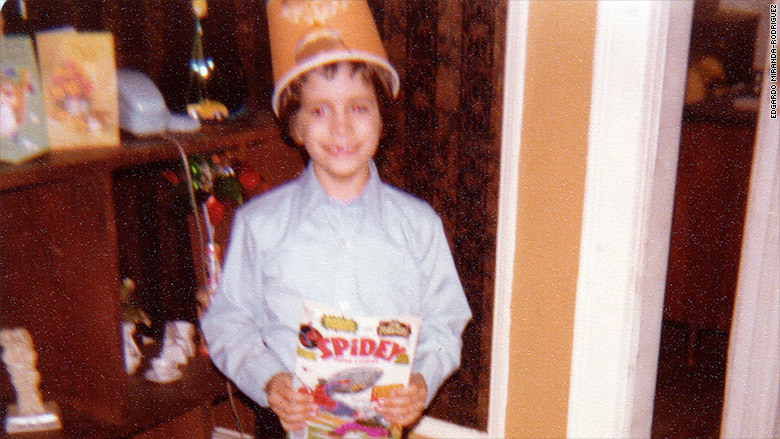 Then, in late November, my mom brought me to Reading and I started school again. But my mom soon left my stepdad and we moved to Syracuse, New York. I arrived for freshman year at Fowler High School, graduated with honors and got a full scholarship to Colgate University. "Before college, I went by Edgar and then I changed it to Edgardo to embrace my Puerto Rican heritage." La Borinqueña deals with a range of social justice issues, from contaminated water to LGBTQ rights. How did you get involved in activism? I started college in 1989 and became a campus activist. We wanted diversity in faculty and a Latino-studies program. In 1992, I met Iris Morales, a community organizer in East Harlem who had been a leader in the Young Lords, the 1970's Puerto-Rican political movement. She was a lawyer and I was in awe. In essence, she became my mom. That year I helped organize the first conference produced by the Latin American Student Organization at Colgate. It was a Young Lords Party reunion. Morales was slated to be my keynote speaker, but after a family emergency she suggested I ask Luis Garden Acosta, who ran the El Puente community center in Williamsburg, Brooklyn, to speak in her place. Acosta described the fight for access to healthcare, free school lunches and equal rights for Puerto Ricans that the Young Lords led and he talked about the work in education and other initiatives that he was doing now in the community. I left college to work with him as a community organizer and art teacher. How were you able to bridge your passion for advocacy with creating comics? My passion for community activism became real when I started working at El Puente, but it didn't pay much so I also worked at a Latino web magazine called Mi Gente where I developed my graphic design skills and wrote about comics. There, I met Joe Quesada who became chief creative at Marvel. Joe is of Cuban descent and he had created a comic based on Santeria gods called "The Santerians." I did a show about it at the Caribbean Cultural Center African Diaspora Institute. So I went from collecting comics to curating an exhibition about comics with Caribbean roots. 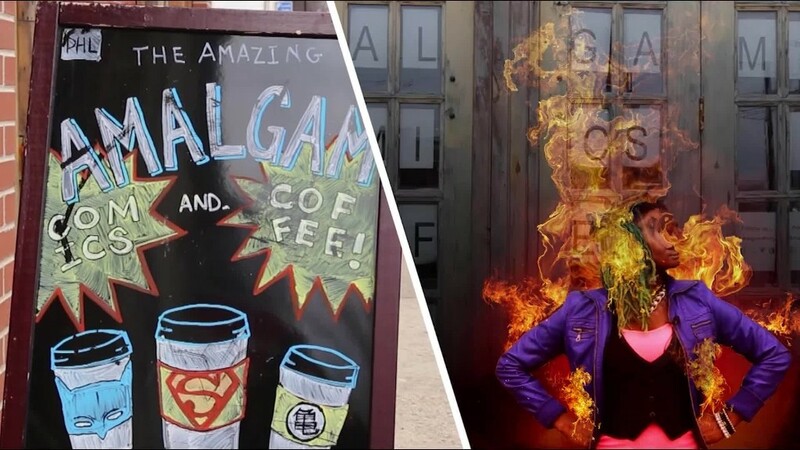 Why did you decide to create La Borinqueña? I co-wrote my first Marvel comic book, Guardians of Loisaida, in 2014 with my partner, Darryl "DMC" McDaniels [of hip hop group Run-DMC], which received critical acclaim. My wife's photo of me holding the comic book on Instagram went viral. It was all over Puerto Rico's news outlets. 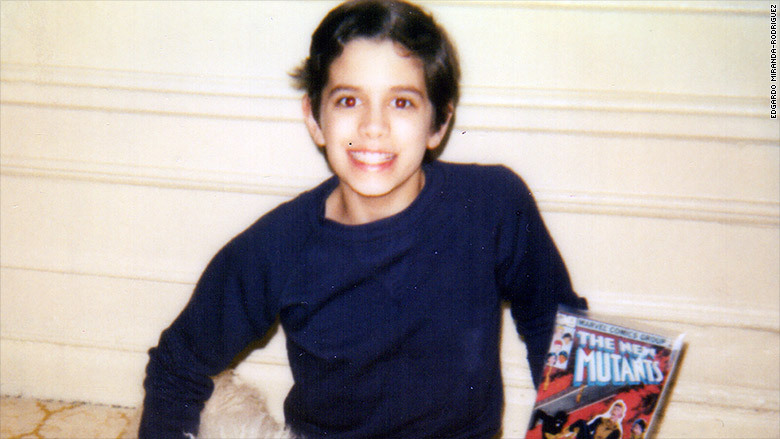 There I was, a Puerto Rican, writing for Marvel comics. Puerto Rico was in dire straits, what with the debt crisis and environmental issues affecting the island and I thought, "What if I gave Puerto Ricans a hero that gives them hope?" I took this responsibility seriously and developed an original character that spoke to my experience as a Nuyorican and a Latino.